What is Mod? 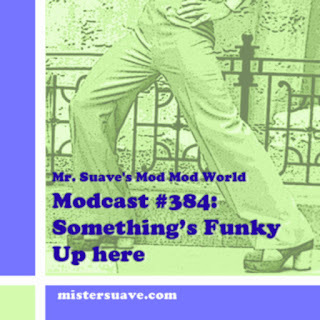 Mr. Suave's Mod, Mod World is one of the web's original modcasts celebrating mod music, and mod-influenced music from past eras including soul, ska, garage, sixties R&B power pop, punk, britpop, acid jazz, lounge, easy listening and more. Welcome to the real world people. 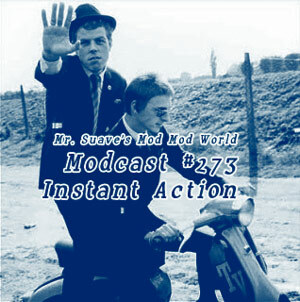 This week's show is full of instant action, and is what's real for mods in the world today. And yesterday. And maybe tomorrow. Speaking of yesterday, today and tomorrow, I've been ruminating of late about what are my top ten favorite songs. Turns out it's rather hard to do. Should I pick my absolute single favorite song in each of ten different genres? Or top ten songs in specific genres? But I'd be curious to know your thoughts about how one can go about picking out their top ten favorite songs. All time? All genres? One genre? Bands only? Solo artists? By decade perhaps? Leave me your thoughts below, or head on over to the modcast Facebook page at facebook.com/modmodworld and let me know what you think. Get the modcast with iTunes! I don't believe in living in the past, but in using the past to enhance living for today.